The Ann and Andy quilt block belongs to the four patch category. Even though it is constructed using 16 patches, they are sewn together in four quadrants to complete the quilt block. 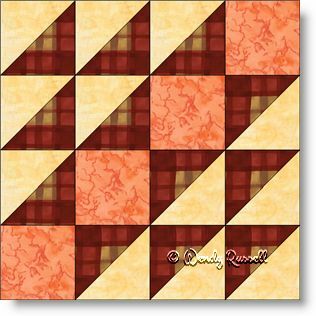 Squares and half square triangles are the only patches in this block, making it an "easy" block, but it also fits into the "intermediate" category due to the number of pieces used to make the quilt block. The sample quilts shown illustrate how to make two totally different looks by simply rotating the quilt blocks.